In many Spanish speaking countries, the Spanish versions "No Hay A Quien Culpar" and "Se Me Está Escapando" replace the English originals ("When All Is Said And Done" and "Slipping Through My Fingers"). Great pressing with very nice sound, sounds a lot better than I expected! They played a gig in Poland in 1976 in the television studio. The music industry's first ever album released on compact disc, the group's swan song record with a new wave flavour (traces of Sparks, Gary Numan, Ultravox and Data are particularly daring and clever). Personally, I was never into ABBA, despite respect and admiration for them although respect and admiration was never actually a conscious perception. I guess, thanks are partially due to Erasure - who remain the perfect mirror image of the Swedish hit factory, a shadow of which is very evident in the UK duo's witty electro-pop catalogue. Love ABBA or not, there is no hit of theirs you wouldn't occasionally whistle along - their 70s stuff so pure and honest, carefree and bittersweet, but it is "The Visitors" with an edge they only partially showed in their previous, and much beloved hit records. Here the melancholy cries volumes and while in typical ABBA fashion, the arrangements/lyrics are added a stronger scent of darkness. The cover photo adds to the tone as the music's perfect match. A snapshot of the group absent from each other - a farewell to it all, the success and the heartbreak, a four letter word that now stands for "eternity". 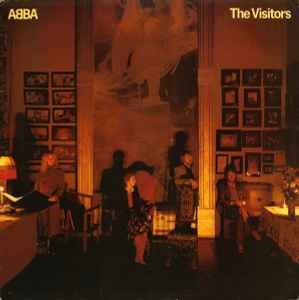 I was led to believe that the Australian and NZ RCA versions of The Visitors are in a gatefold sleeve. Can someone confirm this? Excellent pressing with great depth and clarity. Probably the same as the swedish original pressing? This album is Abba's most sophisticated work. The album feels very musical and grown up (except for "Two For The Price Of One"). The album sounds like it is a mini musical (not suprising that benny and bjorn would create "Chess" with Tim Rice three years later). The album is full of elements ranging from musical theatre, opera, classical music, moods and atmospheres mixed with a pop sensibility. This is the only album I can listen to by Abba and not hear Eurovision cliche's, with the exception of "Two For The Price Of One", the worst part of the album. This is an album that is worth listening to once in your life. An interesting album full of sophistication and well crafted pieces from an established pop act. Is it me, or does the vinyl version (original pressing) really sound so much better than the CD? is the first in history to be manufactured on the new CD format in 1982!